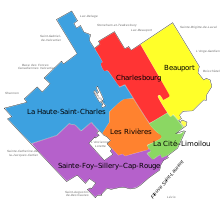 ^ "Historic District of Old Québec". World Heritage; UNESCO. Retrieved January 12, 2009. ^ ^ "Old Quebec City, Seven Wonders of Canada". cbc.ca. http://www.cbc.ca/sevenwonders/wonder_quebec_city.html. Retrieved February 12, 2008. ^ Morrin Centre. "Anglos in Québec". Literary and Historical Society of Quebec. http://www.morrin.org/pages/anglos.php. Retrieved March 15, 2007. ^ "Voice of English-speaking Québec: A Portrait of the English-speaking Community in Quebec". Voice of English-speaking Québec. 2007. Archived from the original on September 29, 2007. ^ "Canada's largest employers by city, 2007: Quebec City." London: University of Western Ontario. Retrieved January 12, 2009. ^ "Labour: Labour force characteristics, population 15 years and older, by census metropolitan area." Statistics Canada. Retrieved January 12, 2009. ^ "Latest release from the Labour Force Survey." Statistics Canada. Retrieved January 12, 2009. ^ "Québec City: Economy, transportation, and labour force." The Canadian Encyclopedia. Historical Foundation of Canada, 2008. Retrieved January 12, 2009.